After 40 years exploring rivers all around the world, Hugh Canard explains why he loves his new river tool. I have been kayaking most of my life, starting as a kid with corrugated roofing iron canoes, then canvas canoes, inner tubes, fibreglass kayaks and 40 odd years of whitewater kayaking all over the planet. Obsessive? Possibly, but it has taken some reflection to realise that what really energises my molecules are rivers. I simply love being on a river. Kayaks, rafts, catarafts packrafts are a means to that end. In order to extend my exploration of rivers into the gorges and more rugged upper reaches it was necessary to invest my time and energy in acquiring a bunch of skills in paddling whitewater, so I learned the hard way by swimming everything, and then the sensible way through instruction and river rescue courses, and by paddling with many generous souls over the years who either role-modelled the techniques and group management, or simply tolerated my presence on their trips. I remember looking down my kayaker’s nose at rafts as “rubber buses” that anyone could float through anything in, whereas us ‘superior’ elite kayakers had genuine hard-earned skills and possessed the physical and mental scars that whitewater kayaking delivers to all who wish to run the higher grade water. We were the true warriors of the rapids. Now I’m very much older and a little bit wiser I enjoy rafts and the comforts they bring and I’m now very attuned to the different way they handle whitewater and the that they are not just fat kayaks. As my curiosity drew me into those hidden tributaries and upper sections I quickly tired of the effort required to drag a hard shell plastic creek kayak up valleys, through scrub and bush to a put in at the top of of an unrun creek. I bought and wrecked a few inflatable boats until I bought an AIRE inflatable kayak, which weighed 16 kg but had the advantage of being compact when deflated. I ran a number of first descents in that boat, all solo trips. The most challenging was the Turnbull in South Westland. The IK had a number of valuable advantages on the water that hard shell boats lacked. The most important one was it slid over rocks more like an eel than a log and was very unlikely to get pinned. Plus I could get out of it in a micro-second. For a solo paddler that means a lot. The IK was still heavy and the older I got the heavier it got. There is tipping point in one’s life when your kids start telling you what to do and instead of reacting badly, you welcome it. So it came to be when my son told me he had a pack raft. Neither of my sons had become infected with my kayaking bug, but they both love being in the hills and valleys and are fit trampers. This was new. He was trying to get the old man on a river, not the other way round. You expect me to paddle down here in that! We ran the Ashley Gorge, a technical Grade 3 run 60km from Christchurch. I’ve been running this in a kayak since 1964. Kayakers rarely run this section at flows below 15 cumecs, but we put on the river with 3.75 filtering through the rocks. My small cataraft was OK but had to be heaved over rocks many times. Dougal, in the packraft just ran sweet lines all the way. Near the end he said “Have a go then”. Semi-reluctantly I agreed. Off I went with my best kayaking strokes ready. I hardly needed to do a thing. This little boat just found its own lines, responded to micro strokes of the paddle, and rotated into eddies with zero effort. I ran over rocks that would stop a kayak dead and ran lines that would pin you at any flow. Two years on and I have been through a few boats in the search for the compromise design solution that offers packraft advantages – light to carry, tough, comfortable, run whitewater up to Grade 3-4, carry gear, rescue-capable, safe, reduced complexity, and ease of portaging; with some desirable features that enable the kayak techniques of railing/edging and rolling. The designs are evolving very quickly, with the industry leaders leading, and the followers copying. There are some welcome emergent signs that innovation in design are coming from outside the USA, from Russia, Germany, Australia, and elsewhere. New brands are popping up every month. I’m bravely/foolishly going to build a DIY packraft and see if I can innovate on my own. I want to brace in it without getting tangled in straps and I want a stiff self-bailing floor that is thinner than 125mm. 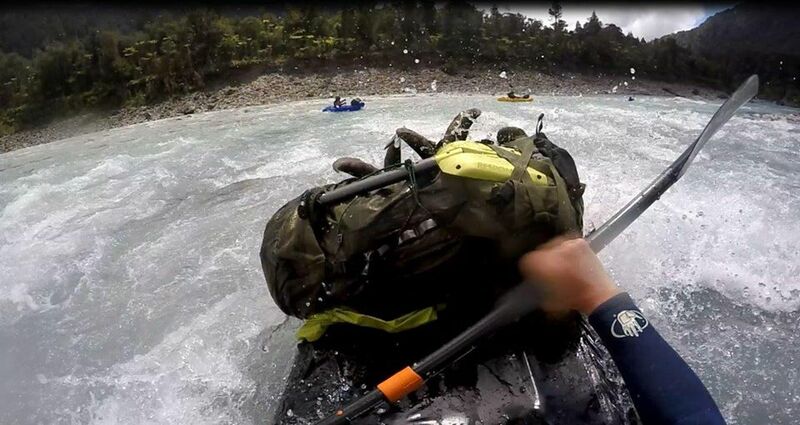 New FaceBook packrafting groups are appearing weekly with so many videos I can’t keep up. Early packrafting posts were about running ever more difficult rivers in remote places. Alaska. New Zealand even. What I see now is more posts about journeys, with lots of multi-day trips on European and Scandinavian rivers and lakes, and certainly many posts in which the hiking section has equal billing with the paddling aspects. There is still a strong element of fit and adventurous explorations where packrafts are the affordable means of getting into a watershed in some remote part of the world like Alaska or Mongolia or Patagonia. Thanks to dedicated pioneers of this burgeoning sport, New Zealand has seen a quiet explosion of visiting packrafters from Australia, the USA and Europe who have not only opened our eyes to the gear, and the new way of experiencing our familiar tramps and traverses, but also the first descents of the smaller rivers and the very upper catchments of familiar rivers. 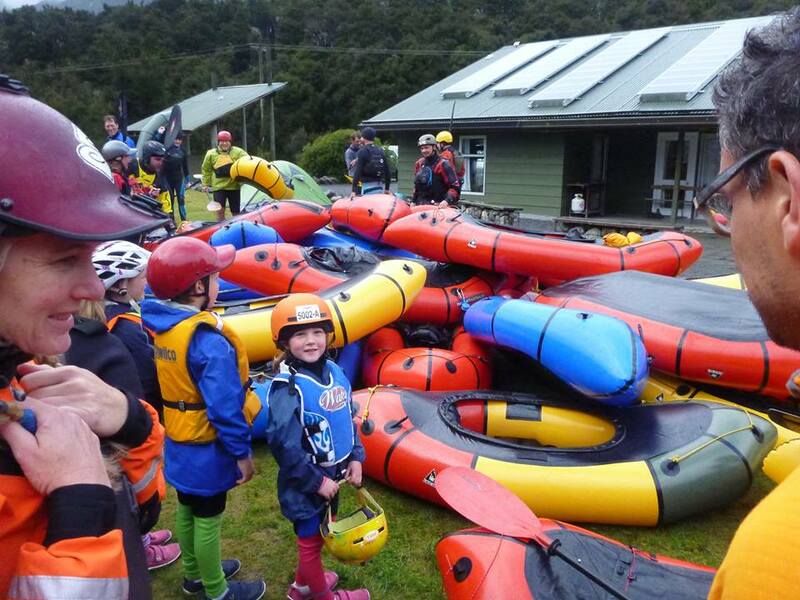 Kiwis have come home and published trips to drool over, and now we have had two NZ Packraft Meets, thanks to Dulkara Martig and her expanding coterie of friends and enthusiasts. There are two outfitters offering commercial trips and three retailers stocking packrafts from the major US and Chinese manufacturers. It’s going off. 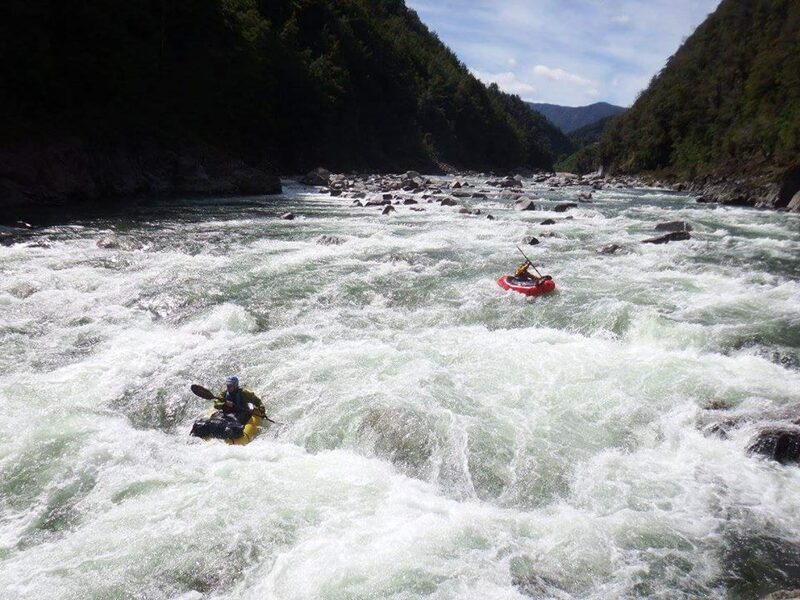 The Federated Mountain Clubs of NZ, representing the tramping and climbing clubs, and Whitewater NZ representing those who want to paddle on water that does the hard work for you, have joined forces and there is an embryo NZ Association formed. This will evolve as packrafters wish it to. New Zealand is made for packrafting. We have an established culture of back-country tramping and hard arse traverses, a huge network of trails, huts, combined with extensive information resources on routes. Kayakers bring detailed knowledge of New Zealand’s wild rivers and their exploration since the 1890s to the present day. The internet makes this knowledge accessible to all. What is going to be interesting is how all the land-based expertise and resource converges with the whitewater aspects. Packrafts are first and foremost enablers. They enable you to combine trips and routes in a way that previously demanded either great strength and endurance or deep pockets for helicopter access and resupply drops. Packrafts are extending the season, extending the range and extending the affordability. For example, in New Zealand you can raft or kayak the upper Ngaruroro and run 61km of the most amazing clear water with deep clear pools, endless Grade2 and 3 rapids, open tussocklands, unspoiled native forest and deep gorges. You have to fly in, and that costs. You have to catch the river with above normal flow, and that means Labour Weekend is almost your only slot. It’s hard to plan for and these factors limit the opportunity. Convergence – tramp, hunt, fish, paddle, explore. Now you can hike in from the get out to a hut, blow up your packraft and float out self-contained. 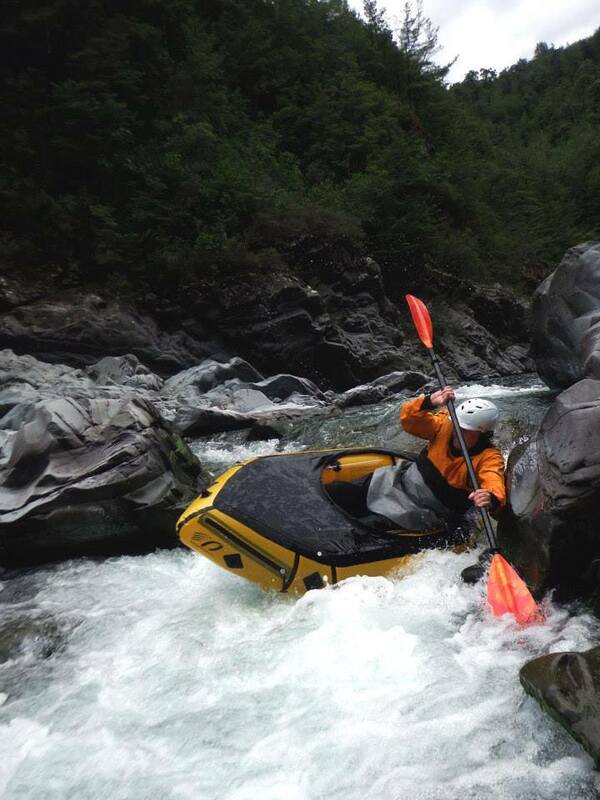 And you can run the upper river in a packraft more or less at any flow and you will not meet any rafts or kayaks. Your interest may be river paddling, or fly fishing or hunting, or all three. It’s all possible for more of the year, for more people, thanks to packrafts. Call it convergence. I call it opportunity, and I’m bursting with curiosity to see where packrafts will take us.